Fifty years ago, the city was a small fishing village and trading area beside Dubai Creek. Today, the old town remains home to the Gold Souk, or gold market, and retains much of the character of the mid-20th century. Elsewhere, however, the city is completely modern. The city-state of Dubai is one of seven emirates that comprise the United Arab Emirates, or UAE, and has been presided over by the Maktoum dynasty since 1833. Within the current government structure, the emir of Dubai is also the country's Prime Minister and Vice President. While Sheikh Mohammed, his brother Sheikh Maktoum and their father, Sheikh Rashid have been benevolent monarchs, the country’s direction is clearly decided autocratically. Thus far, that has not been a bad thing as far as the progress evident to the world. The sheikh has also initiated other changes intended to make the government more adaptable and responsive to the needs of its citizens. In February 2016, Sheikh Mohammed announced major structural changes to the makeup of the federal government “[T]o enhance the readiness of the leadership to the challenges of the future," according to the official UAE webpage on the Government of the Future. One of the new initiatives will establish the post of Minister of State for Happiness and Wellbeing, “[W]hose primary mission is to harmonise all government plans, programs and policies to achieve a happier society,” the webpage said. While that forward-looking approach and goal of making Dubai the world’s most visited city must necessarily include welcoming of visitors from a broad range of cultures, that does not mean Dubai is surrendering its own culture on the altar of progress. More on that later in this article. Among the interesting aspects of my visit to Dubai was observing how the old and the new interact symbiotically as well as how they continue to conflict with each other. Dubai’s shiny new buildings, including its shopping malls, are clearly modern – some might even be considered avant-garde – but their placement follows traditions that are hundreds, if not thousands, of years old. 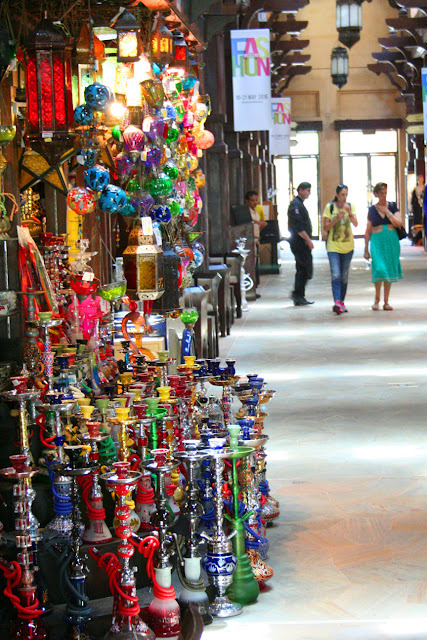 In the West, we pay little attention to the placement of stores, either in town squares or shopping malls but in the Middle East, souks were arranged by what they sold. Souks selling women’s clothing were located near others with the same type of merchandise. Likewise, men’s clothing purveyors were clustered together, fish mongers were next to each other, vegetable and fruit producers were near others selling the same type of merchandise. In many ways, it made sense. If a person needed food, they would need only go to a specific area rather than heading out hither and yon. And “hither and yon” is a lot tougher on foot or camel-back than in a mini-van or SUV. Today, many of the area’s shopping malls are arranged similarly. While not as strict as in the days of the souks, Dubai Mall, the Mall of the Emirates and indeed the city itself are, to a great degree, arranged by the types of goods or services they sell. The city itself reflects a certain compartmentalization. There is a stop along the Metro called Business Bay; pretty self-explanatory. 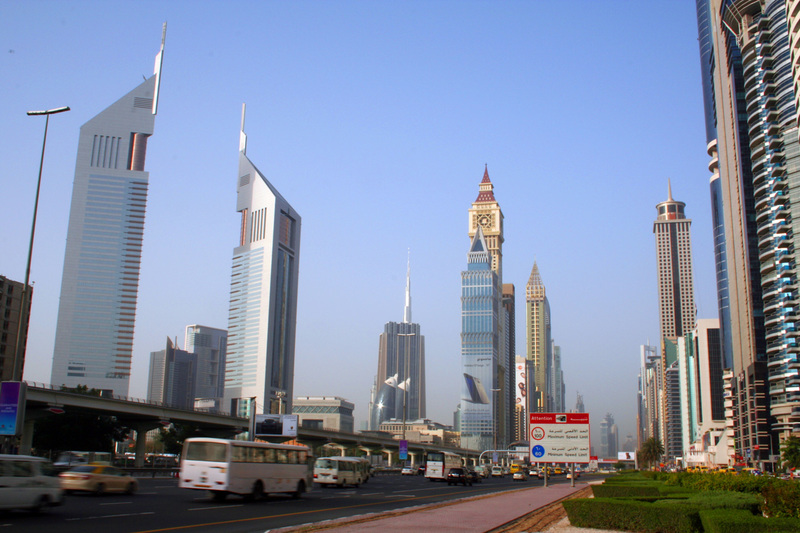 In the area around the Dubai Marina, there are Dubai Investments Park, Internet City and Knowledge Village. As their names suggest, they are home to many businesses and educational institutions that share certain similar characteristics, thus continuing to apply long-standing practices in a more modern setting. When contrasting the old and the new, it is interesting that Dubai officially courts something that might have been frowned upon in the past: Hollywood and its movies. Dubai has been the setting for scenes in several movies, including “Mission Impossible: Ghost Protocol,” in which Tom Cruise’s character Ethan Hunt climbs the outside of the 160-story Burj Khalifa. “Fast and Furious 7” includes scenes filmed in Dubai, Abu Dhabi and elsewhere in the UAE. The city will host its 13th annual International Film Festival in December, an “[A]nnual platform for Arab film-makers and talent, as well as for showcasing the emerging cinema movement,” according to the festival’s website. Although its stated focus is on Arab filmmakers, Western actors including Catherine Deneuve, Jake Gyllenhaal and Emily Blount have been honored and awarded at past festivals. Identifying the "no man" zone on the Metro. 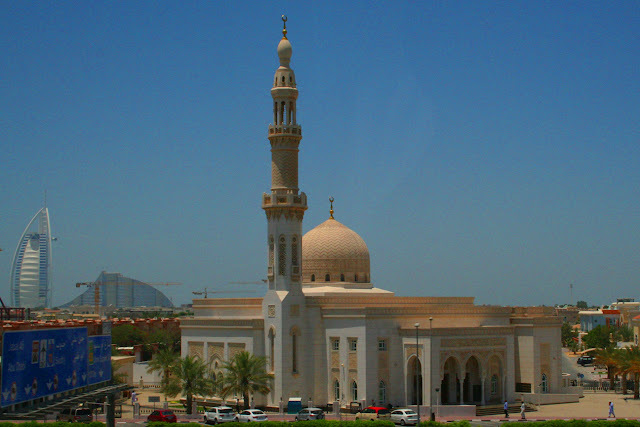 Despite the emirate’s overall march toward modernism, many of the old attitudes and practices remain in place. 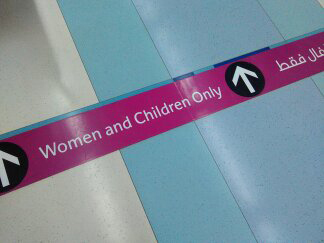 On the city’s Metro trains, trams and buses, certain sections are reserved for women and children. Men face a fine of 100 United Arab Emirates dirhams (abbreviated AED) if they are found in those areas, which are delineated by a pink stripe. Public displays of affection, including kissing and holding hands, do not fit the local customs and culture. "Holding hands for a married couple is tolerated but kissing and petting are considered an offence to public decency," according to The Dubai Code of Conduct published by the Government of Dubai's Executive Council. Consumption of alcohol is another area where the old and the new have not been fully reconciled. 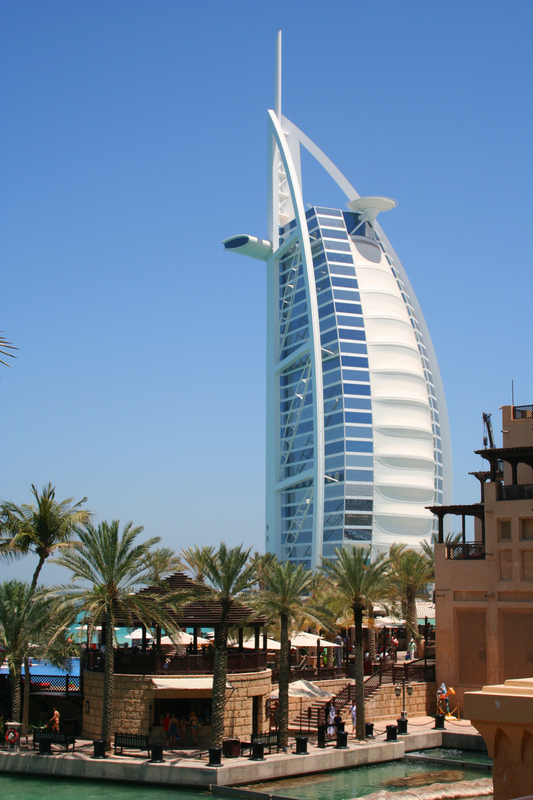 Unlike many – if not most – Western countries where alcohol is ubiquitous, it is more difficult to find in Dubai. A misconception I heard repeated quite often is that only large hotels can get licenses to buy and serve liquor. While not entirely accurate, it is true that licensed establishments are rare outside hotels that cater to Western guests. As a result, at many large chain restaurants like Chili’s where diners are accustomed to grabbing a beer to wash down their tacos and burritos, they must make do with soft drinks. When dining out, it will be useful to understand that tipping is customary in Dubai but there is a caveat: Tips – including, in some cases, the “service charge” or “fee” added to restaurant bills – don’t always go to the person providing the service. A visitor who wants to reward good service directly should ask the staff if they receive the tips and, if not, slip them cash discreetly. Guests can also ask to have the automatic service fee removed from the bill. Tipping amounts are a bit lower than customary in the U.S. For example, a tip of 10 to 15 percent to reward good service in a restaurant is acceptable, while 15 to 20 percent is more the norm in the states. For a taxi driver, round the fare up to the nearest note if the driving was acceptable. Food delivery personnel, valet parking assistance, bell persons all warrant tips of AED 5 to 10. On a related note, weekends in the UAE are Friday and Saturday, and Friday brunches are a very popular activity, much as Sunday brunches are in the U.S.
An astute observer might see some apparent incongruities where tradition and progress intersect. While many men wore traditional Arabic garb including the white, flowing robes called jubba and a head scarf called a keffiyeh secured by two black ropes called agal, many also carried smartphones and iPads. Many women wore long black robes called abaya and veils called hijab that showed only the eyes. However, it was often apparent that those eyes had been carefully made up. When the hijab was pulled aside to allow them to eat at a fast food establishment along Shiek Zayed Road – an establishment that served “only Halal beef” -- it was obvious that they were no stranger to lipstick. The fingers that clutched designer handbags had been carefully manicured and, though fingernails remained their natural color, the toes showing through the sandals were clearly sporting the latest color in polish. While traditional garb can be seen most everywhere, Dubai is clearly a multi-cultural city with residents and visitors alike sporting clothing from across virtually all cultures. Dubai is very long and narrow with the most densely populated area approximately five miles wide and 20 miles long. At the northern end of that stretch is Dubai International Airport (DXB), which is the most likely point of entry for visitors to the UAE. 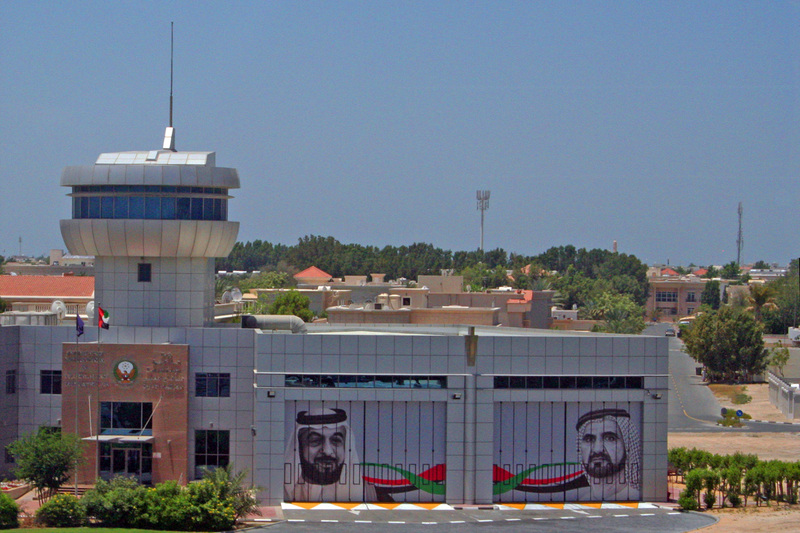 DXB is a very large airport, so visitors should expect fairly long walks, often including tram rides like the one below, from their arrival gates to customs and immigration, and then on to their waiting cars or public transportation. 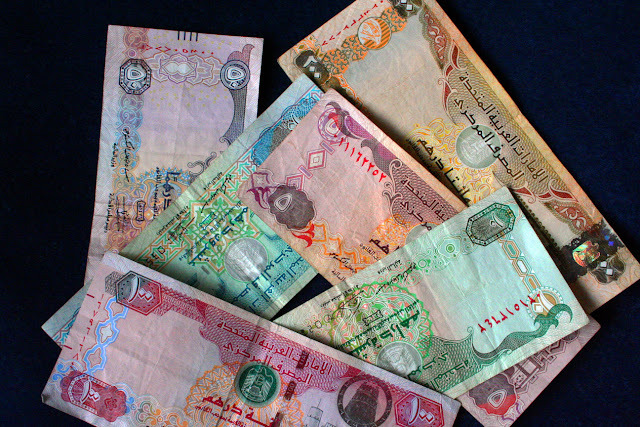 The local currency is the United Arab Emirate dirham, which is abbreviated AED or Dhs. Visitors who arrived without a bit of the local currency on hand may want to obtain some before leaving the airport. There are many branches of The Dubai Exchange in the airport as well as in Metro stations and shopping malls where exchanges can be made. Importantly, Dubai is the only destination to which I have traveled where the currency change bureaus do not take significant advantage of those buying or selling foreign currency. The Dubai Exchange had posted rates for buying and selling U.S. dollars that were very close to the rates quoted by organizations like Fourex and were better than both the rate I got using my credit card and the rate I obtained when buying dirhams from my bank in the U.S.
For example, a credit card bill presented after one lunch expressed the transaction in both dirhams and dollars and gave me the choice of currency for the transaction. Dividing the dollars by the dirhams showed that I was being offered an exchange rate of 3.5 dirhams to the dollar when the Fourex exchange rate was 3.67 to the dollar. At that time, outlets of the Dubai Exchange were offering to buy dollars at 3.64 dirhams. My bank sold dirhams at 2.72 to the U.S. dollar. The exchange rate notwithstanding, prices is Dubai can appear a bit daunting. For an approximate cost in U.S. dollars, dividing the price in dirhams by four (or 3.5 if you’re a math whiz) will put that AED40 glass of wine or the AED120 dinner into its proper perspective. Once a visitor has cleared customs, collected their luggage, perhaps exchanged some currency and is ready to leave the airport, there are several options. Visitors who arrive in Emirates’ First or Business class have access to the airline’s chauffeur drive service and can take a town car from DXB to their final destination anywhere in the UAE. Arriving visitors can also take the Dubai Metro, which extends from DXB to the Dubai Exchange at the opposite end of the city. A day pass is AED22 as of this writing, or passengers can purchase a fare card from which the cost of each individual journey is deducted. There are also shared shuttles available as well as private sedans, vans and SUVs and, of course, taxis. Taxi fares are per the meter, with a minimum fare of AED12. One caveat for men when riding the Metro, buses or trams: certain cars and sections of cars are reserved for women and children only. As mentioned earlier, there are fines for men found in those areas. While I am hesitant to state anything as an absolute, my experience in Dubai was that virtually everyone speaks English. Certainly, the signs I saw were bilingual, in Arabic as well as English such as the one here, so there was no difficulty in determining their meaning. Dubai’s emir Sheikh Mohammed studied English at the Bell Educational Trust's English Language School in the United Kingdom and the British influence is obvious. 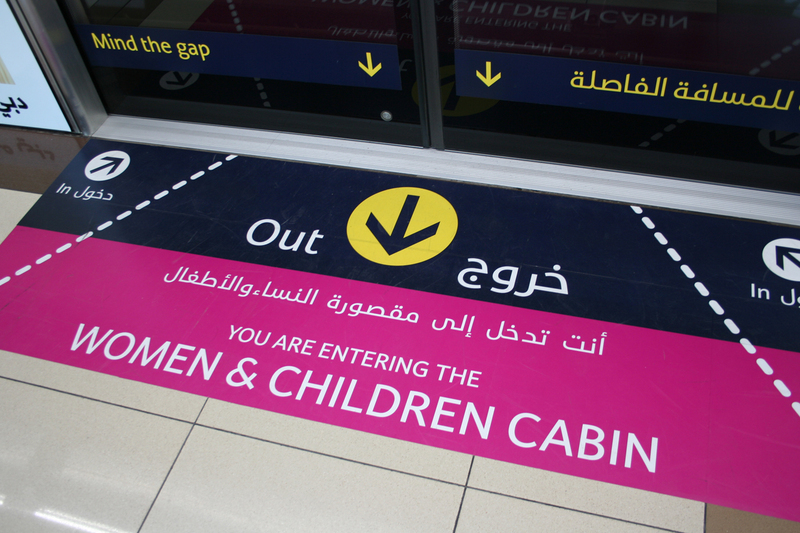 Signs in the city Metro train stations remind riders “Queue to the right” and to “Mind the gap.” HP Sauce, a popular condiment in the U.K., is readily available in many restaurants, and British retail icons Harvey Nichols and Fortnum & Mason’s both have branches in the Dubai Mall and Mall of the Emirates, the city’s two biggest malls. Most of the city’s tall buildings have been constructed in two or three clusters. One such cluster begins around the World Trade Centre and continues south along Sheikh Zayed Road until the area of Business Bay. From there, the city becomes a collection of low-slung buildings not more than two to three stories high, punctuated by spires of local mosques piercing the sky, until one nears the Mall of the Emirates. 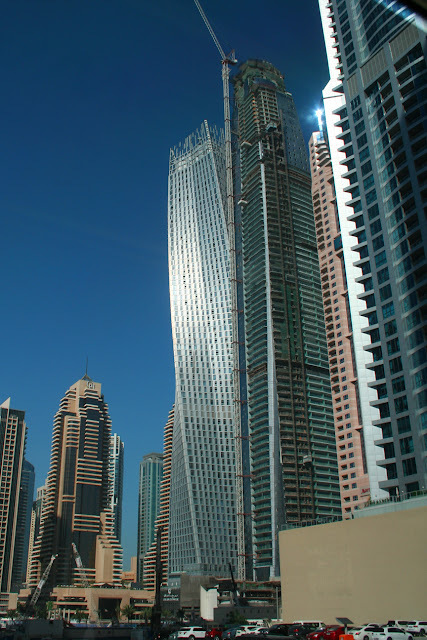 In that area, the buildings again reach skyward and continue to do so through the area of the Dubai Marina and Jumeriah Beach Resort. But it may not be that way for long. Construction is underway all over the city with cranes dominating the skyline in many areas. When I visited in May, a large canal was being constructed just south of Business Bay to connect Dubai Creek to the Persian Gulf. The Dubai Water Canal was completed and water began flowing through it in late October 2016. Should you arrive in Dubai without appropriate attire, not to worry. If there is one thing that is abundant (other than heat), it is shopping. Neither Beverly Hills’ Rodeo Drive, Chicago’s Magnificent Mile nor Honolulu’s Ala Moana Blvd. have anything on Dubai when it comes to opportunities for retail therapy. 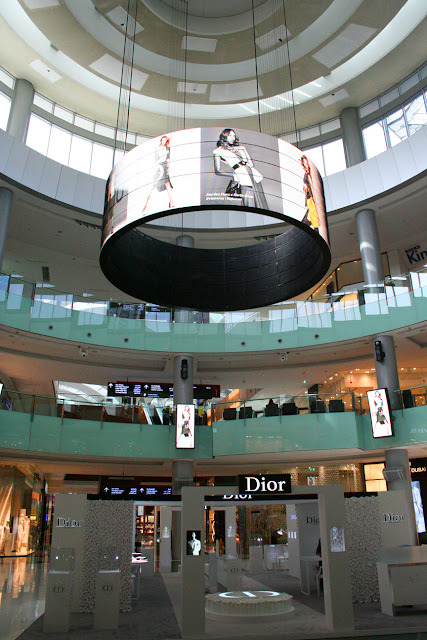 Dubai is home to two of the world’s largest shopping malls: The Dubai Mall and the Mall of the Emirates. The Dubai Mall is the largest mall in the world by total area and houses 1,200 stores including the Dubai Ice Rink. 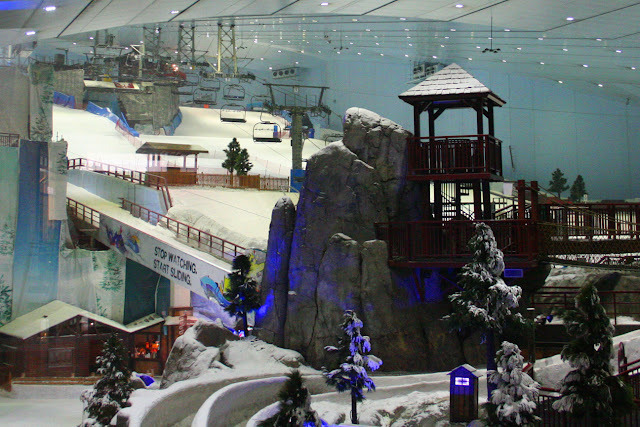 The Mall of the Emirates, which is slightly smaller with more than 700 stores and 11 anchor tenants, is home to Ski Dubai, the Middle East’s first indoor ski resort and snow park. Both malls have a broad cross-section of upmarket shopping. The Dubai Mall features an outlet of the British retailer Fortnum & Mason’s while the Mall of the Emirates has a three-story outlet of British fashion retailer Harvey Nichols. Both have a broad selection of fast-food as well as fine-dining establishments for those times when one just has to get off their feet. Located adjacent to the Dubai Mall is the tallest building in the world, the Burj Khalifa. Opened in Jan. 2010, its thin spire reaches 2,922 feet, towers above the rest of the skyline and can be seen for miles. At the foot of the tower is the Dubai Fountain with jets and lights choreographed to music. A ticket to the tower’s observation deck or a seat in the At.Mosphere restaurant on the 122nd floor are among the most popular tickets in town and don’t come cheap. 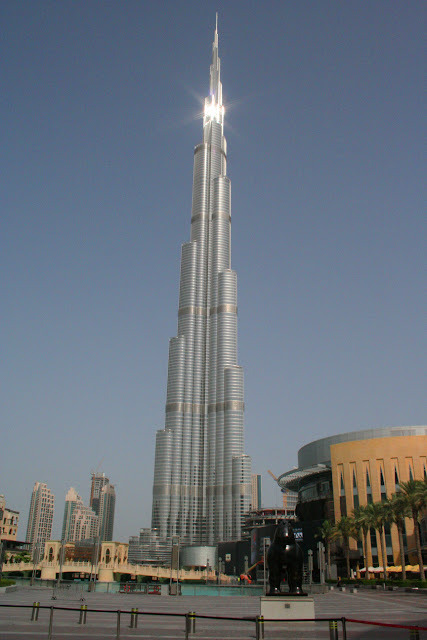 The Burj, as it is called by locals, offers visitors the opportunity to visit two different levels of the building: At The Top at level 124, and At The Top Sky at levels 125 and 148. Visits to At The Top are available during non-prime hours of 8 a.m. to 3:30 p.m. and again from 6:30 p.m. until closing at a cost of AED125 for adults. During prime hours, the price climbs to AED200 for adults using General Admission or AED300 for Immediate Entry admission. Going to At The Top Sky, from opening until 6:00 p.m. will cost AED500 for adults. 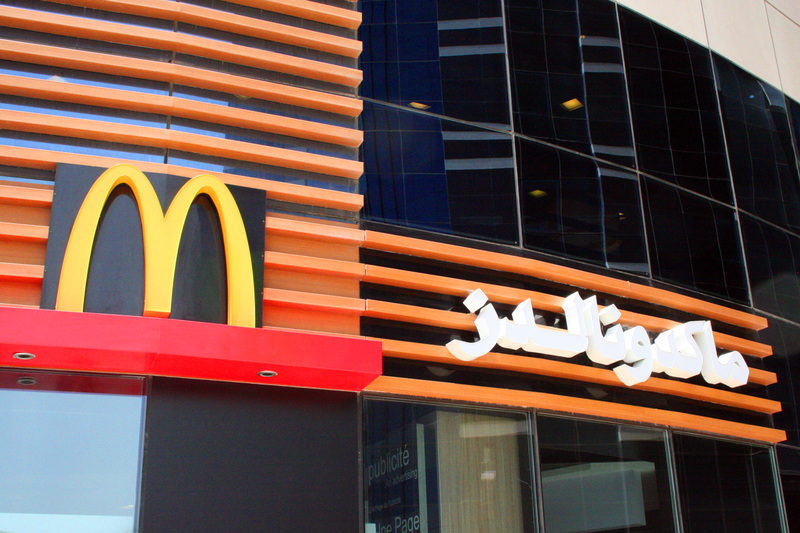 From 7:00 p.m. until closing, the price drops to AED350. At today’s exchange rates of about AED3.67 to the U.S. dollar, that means getting anywhere near the top of the world’s tallest building will cost between $35 and about $135. As if high-end shopping wasn't enough, in a rather amazing display of ostentation the Mall of the Emirates has an ATM that dispenses ... gold! Gold-dispensing ATMs, part of the Gold to Go network, are also located in the Burj Khalifa, the Atlantis Palm Resort, Galleries Lafayette and the InterContinental Hotel. More traditional shopping opportunities are available at the Souk Madineh Jumeriah, located near the iconic Burj Al Arab hotel on the shores of the Persian Gulf. Unlike the large malls, which are similar to many malls in the West, the Souk Madineh Jumeriah is more a traditional marketplace and guests are expected to conduct themselves accordingly, including adhering to guidelines mandating “sensible dress” and the avoidance of wearing beach wear. The Souk Madineh Jumeriah is most easily reached by taxi. Visitors who catch a taxi in the Dubai Marina district may find themselves being driven along Al Sufouh Rd. which, between the marina and the souk, is lined by plain walls approximately eight feet high, dotted from place to place by entrance portals. My taxi driver told me that behind those walls are residences for members of the royal family. 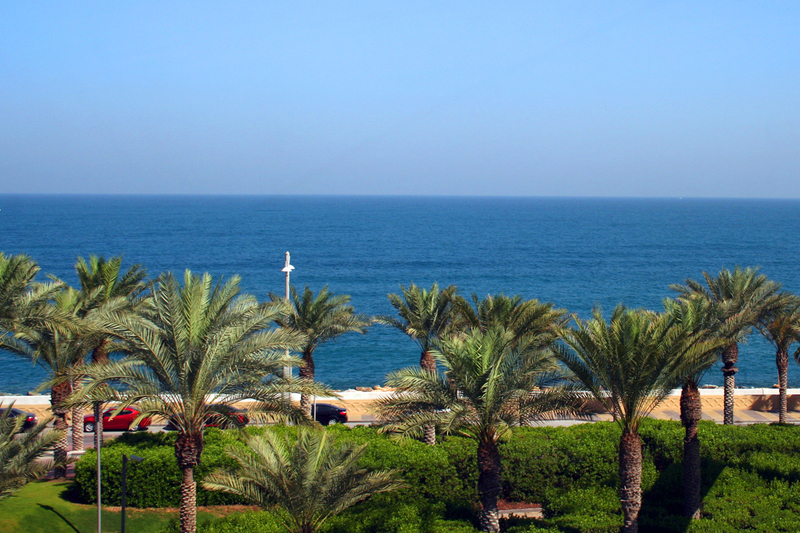 Whether that is accurate or not, the entire span of Persian Gulf beach along that stretch is clearly designated “Private Beach” and the area is home to several upmarket hotels, resorts and dining venues. Some resorts have their own shopping areas. 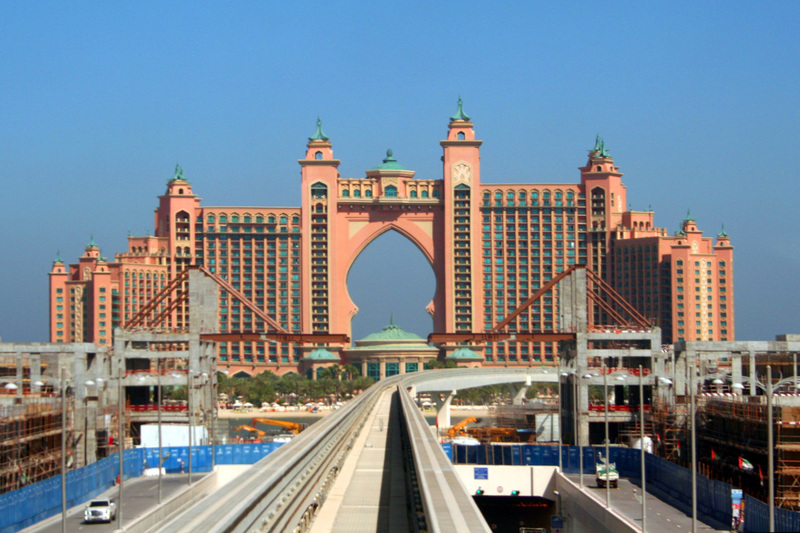 Atlantis The Palm Resort, at the end of the Palm Jumeriah, is such a resort. Reached by bus, car, or by a monorail from the Jumeriah Palm tram station in the Dubai Marina area, the Atlantis has a range of high-end shops including Lacoste, Porsche Designs, Rodeo Drive, Via Rodeo, Longines and Omega watches, jewelry by Chopard and Tiffany and Co., and a variety of smaller boutiques. Located on a palm-shaped, man-made island, The Atlantis has its own water park, a range of restaurants and other activities and attractions. In my estimation, such a resort must appeal most to people who want to say they have been to Dubai but who do not actually want to experience Dubai. While The Atlantis is similar in design to its sister property in the Bahamas, other buildings in Dubai reflect the country’s embracing of avant-garde architecture. The Cayan Tower in the Marina area appears to twist 90 degrees between its top and bottom floors. The Burj Al Arab hotel on the shores of the Persian Gulf was designed to resemble a ship’s sail. A building off Sheikh Zayed Road resembles the tower that houses London’s legendary Big Ben while a pair of buildings nearby resemble Rev. Robert Schuller’s Crystal Cathedral. New buildings currently under construction – and they are everywhere – will continue to push the architectural envelope. A new structure, is planned to be completed in time for Expo 2020, which Dubai is hosting. The Tower at Dubai Creek Harbour will surpass the Burj Khalifa as the world's tallest. At the heart of the Arab world, Dubai is a multi-cultural city. While visitors will see men and women dressed in the traditional garb mentioned earlier, visitors will also see people dressed in clothing styles common in the West, as there are many ex-pats from a number of countries in Dubai. While there are not many customs visitors are expected to follow with regard to their attire, conservative dress is more the norm and the best choice for not standing out as an obvious tourist. In all, Dubai is a fascinating city to visit, as much for its culture as for the view of what a modern city can be when provided with a clear direction, and the political will and adequate funding to make it happen. Granted, the direction and political will are more easily defined and obtained when a single individual or small group of true leaders are in power instead of the culture that exists in much of the world where all stakeholders must be heard, then everyone has to hold hands and sings Kumbaya before deciding what time to break for lunch. Dubai is an extremely photogenic city. While I took literally hundreds of photos, those above are merely a small sampling of what is available on my PhotoBucket site here. I am hoping to offer something back and aid others like you helped me. Thanks for your own effort on this website. My niece enjoys going through investigations and it's really easy to see why. Almost all learn all relating to the compelling manner you render worthwhile guidelines on this blog and even attract response from visitors on that area plus our daughter has been studying a whole lot. Have fun with the rest of the year. You're doing a great job. I am really impressed with your writing abilities as smartly as with the structure in your blog. Is that this a paid topic or did you customize it yourself Either way stay up the excellent high quality writing, it is rare to look at a great blog like this one today. Anon - Thanks for your comments. I enjoy writing, and am glad other enjoy reading what I've written.